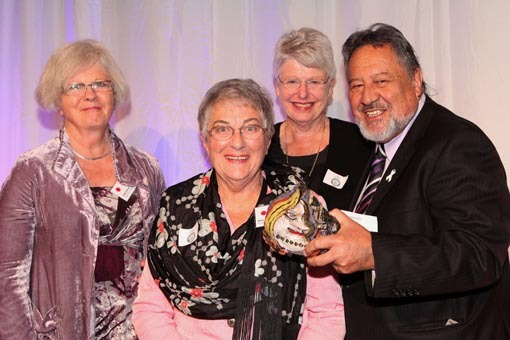 A group of women who volunteer their time and pass on their quilting skills to prisoners at Auckland Region Women’s Correctional Facility has won the inaugural Big ‘A’ Prison Arts Community Award 2012. The award was one of six in Arts Access Aotearoa’s Big ‘A’ Awards, presented in the Banquet Hall at Parliament on 18 July. The Quilt-Stitch Group’s team leader, Mary Ann France, says the award was unexpected but it was great to be recognised. “We were all quietly excited about receiving the award, evidenced by the fact that all but two of the volunteers were able to hop on to plane and come down to Wellington to attend the ceremony,” Mary Ann says. “No one in our group is doing this with thoughts of honour and glory. We all acknowledge there is a huge need for prisoners to have some practical skills to take with them when they go back into the community. The Big ‘A’ Prison Arts Community Award recognises the outstanding contribution of a community group working with the Department of Corrections and using the arts as a tool to support the rehabilitation of prisoners. Judges described the Quilt-Stitch Group as “an excellent grassroots initiative”, calling quilting a “perfect activity for community engagement”. The Quilt-Stitch Group is made up of 13 volunteers who travel to the women’s prison six times a month. Here, they share their skills and love of quilting with the prisoners. In the process, the volunteers foster self-esteem, numeracy and literacy among the women, and model acceptable social behaviour. Each year, approximately 50 women take part in the programme. The skills taught include sewing, measuring, designing and embellishing their quilts. Learning to use a sewing machine is an option. The prisoners start small, learning to use a needle and thread before progressing to cushions, wall hangings and making quilts for sick babies at Middlemore Hospital. The volunteers say that one of the most important aspects of the work is that it provides an opportunity for the prisoners to be creative. The typical quilters’ “gather round” also helps develop creative relationships within the group as they share ideas and assist each other with their projects. “I can now teach my daughters"
They know they are succeeding when the prisoners say things such as, “I can now teach my daughters how to sew” and “I want to carry on with this when I leave”. The group was set up in 2008 and most of the volunteers belong to the Auckland Patchworkers and Quilters Guild, one of the largest patch-working and quilting organisations in New Zealand. Two Rotary Clubs initially supplied money for materials and instruments, and now people from all over New Zealand, including members of the Quilters Guild, donate fabric, thread and quilt blocks. 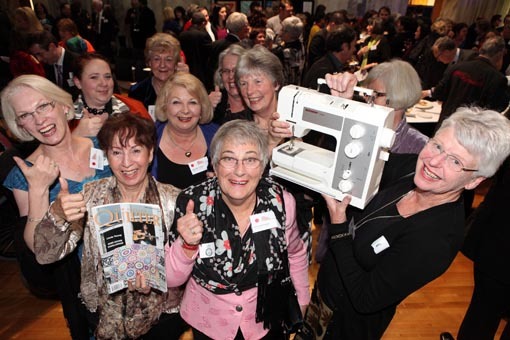 The Quilt-Stitch Group received a sewing machine donated by Bernina New Zealand. This group and the Arohata Women’s Prison volunteer quilters received an ongoing subscription to New Zealand Quilter magazine, plus a percentage of the proceeds from sales of cards from Minerva Textiles, Books and Gallery. Original generation time 1.6846 seconds. Cache Loaded in: 0.0005 seconds.